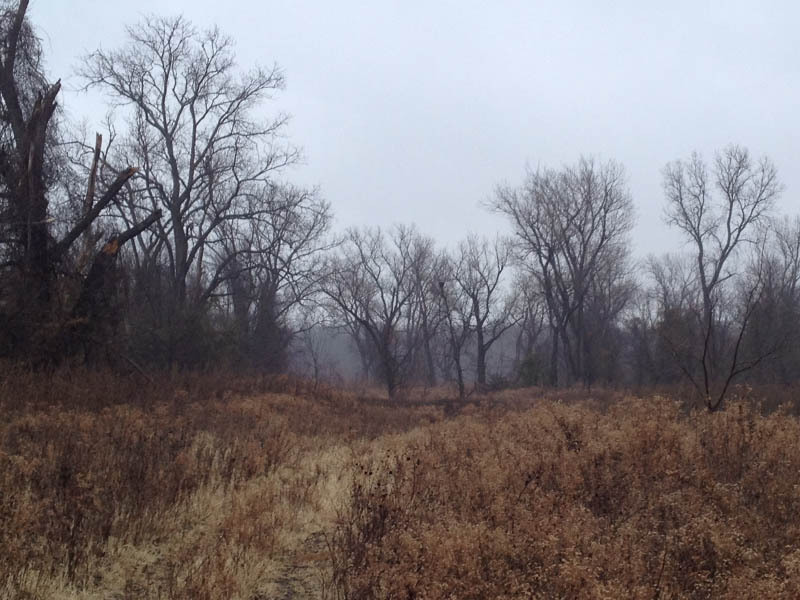 This cool January morning was not the kind of day I usually set aside for a hike in the woods. The weather on this day was overcast with a weird misty rain. No big drops fell from the sky, and you couldn’t even call this weather condition a drizzle. The rain was more akin to what you get from one of those misting systems that they run on restaurants patios in the summertime to help keep you cool. 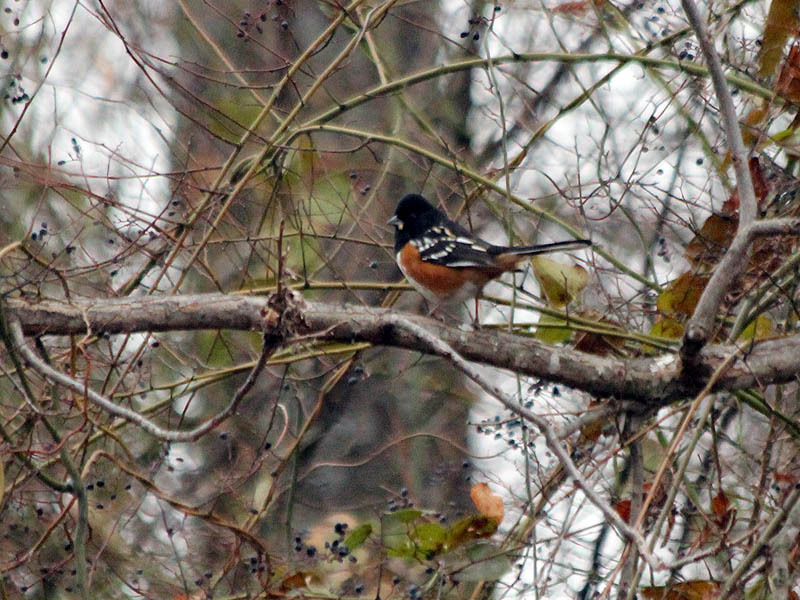 The dreary winter weather had a beauty all of its own. Of course my preference when spending time outdoors is nice weather with plenty of sunshine. Beyond the obvious reasons, you also need good lighting in order to get the best photographs. The weather was not ideal on this morning, but sometimes I have to fit in a hike when my schedule allows it. I had a special destination in mind for this outing, and I didn’t want to put off going to some later date. From the minute I stepped out of my car I could tell this hike was going to be different. The light rain settled an eerie hush over the countryside. 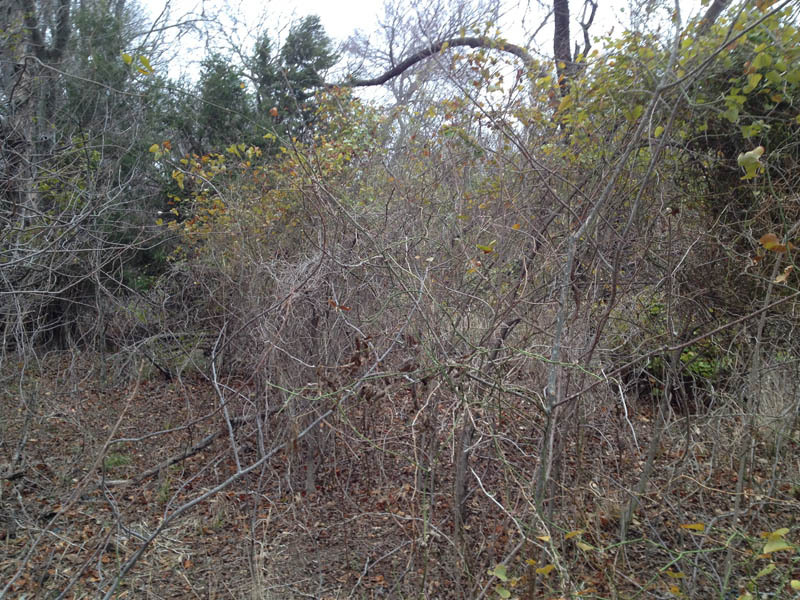 This would be especially noticeable after I entered the woods. Later in the day, as more water collected on the trees, large drops would fall from the branches making it sound as if it was raining harder than it was. The overcast also made for poor picture taking conditions. Most of the photos I have included with this post are murky and will be suitable only to illustrate the narrative. 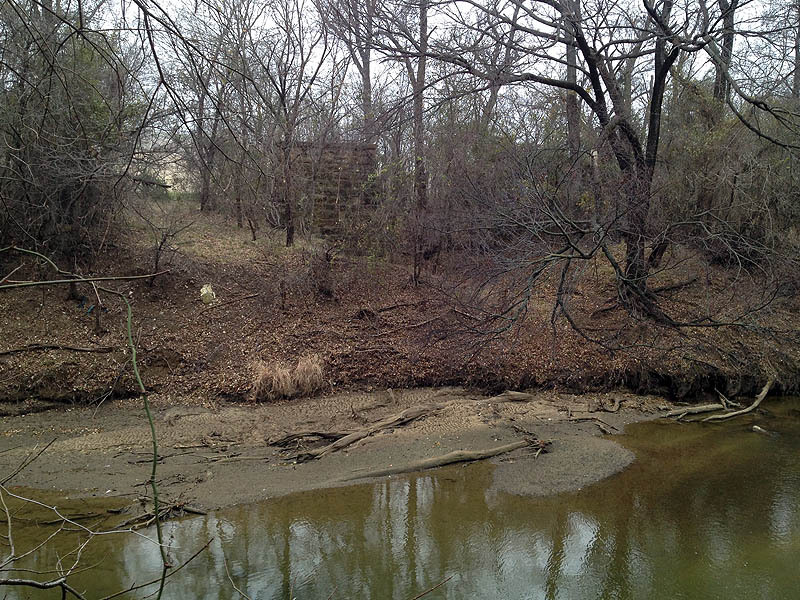 My objective for the day was to visit the location of old College Street bridge over the Trinity River. 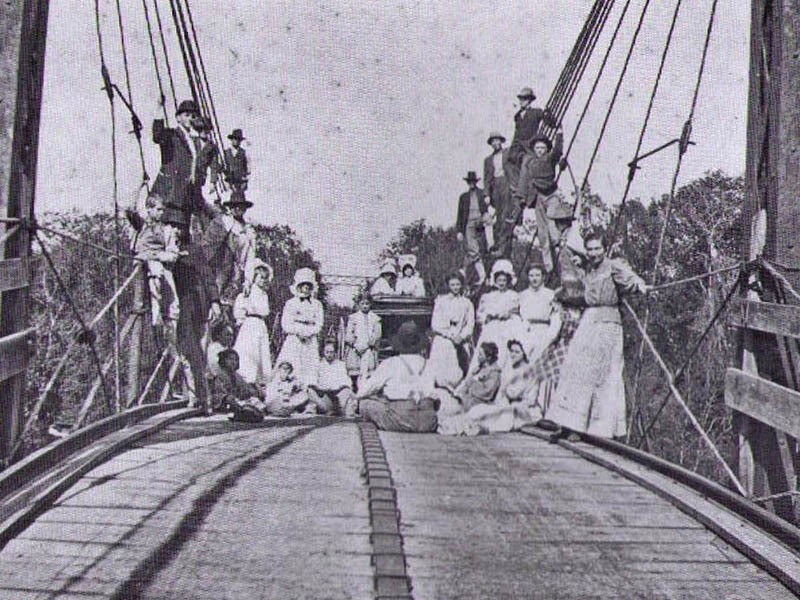 I have posted about this bridge in the past, and you can read that account here: Journal – History Lesson. 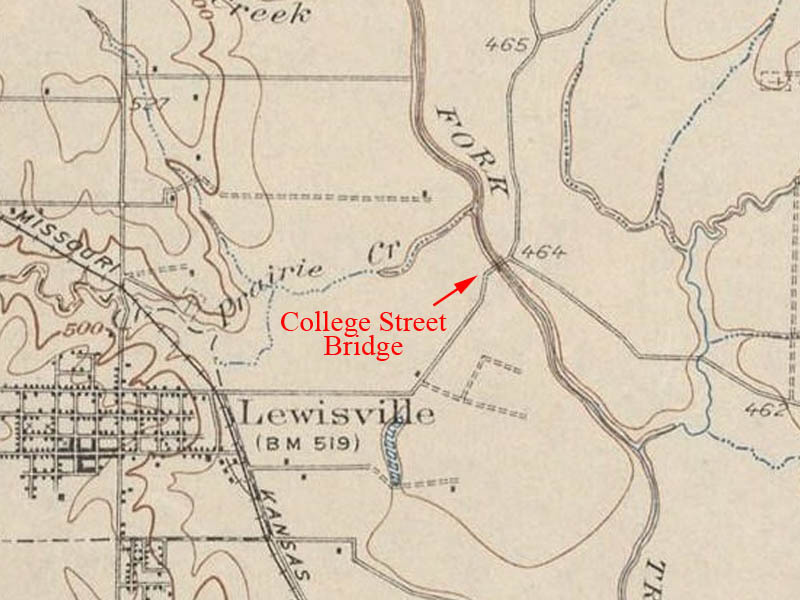 The location of the near 100 year old College Street Bridge on a 1925 USGS Map. I wanted to follow one of the old forgotten roads that led to the bridge and have a look at what’s left in person. 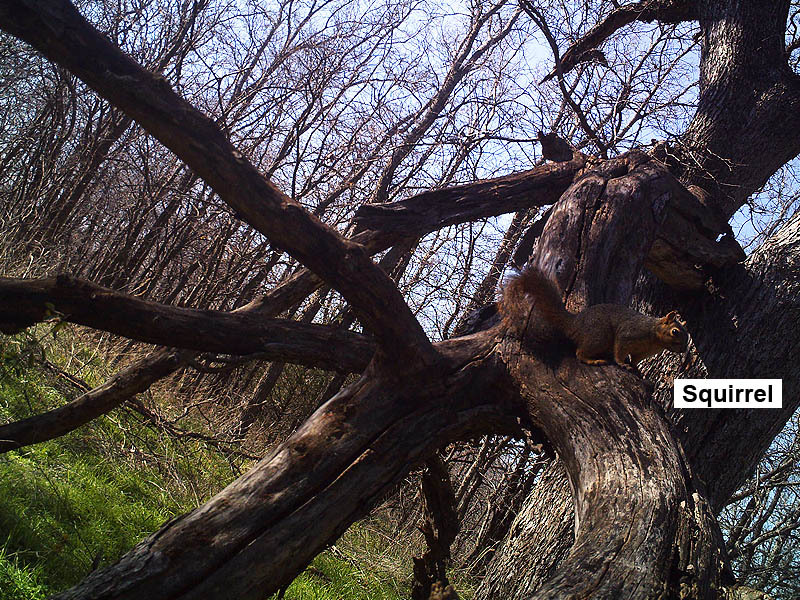 Afterwards, I planned to check on a little trail camera project I was running nearby. 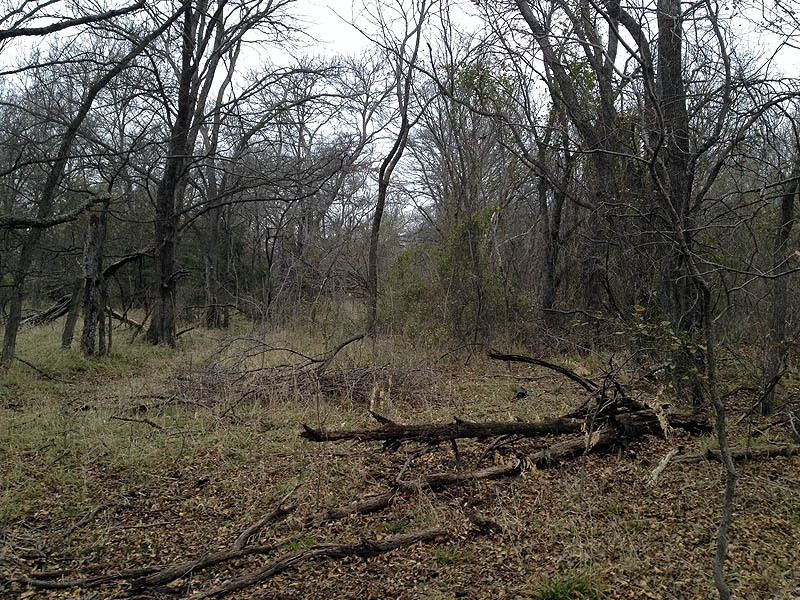 So, with a little special permission in hand I headed south toward the rarely visited bottomlands along the Elm Fork of the Trinity River. 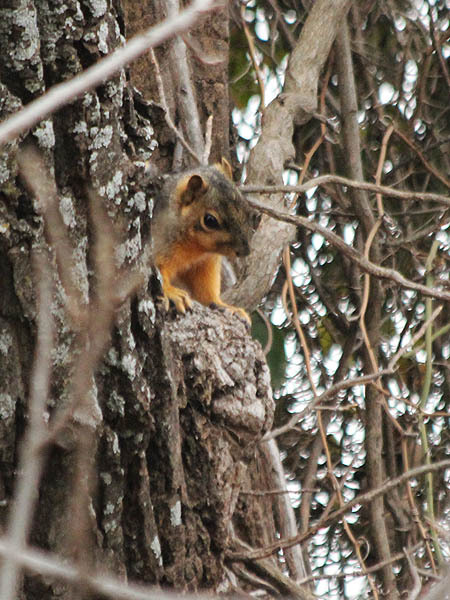 Wildlife was very active today in spite of the wet weather. 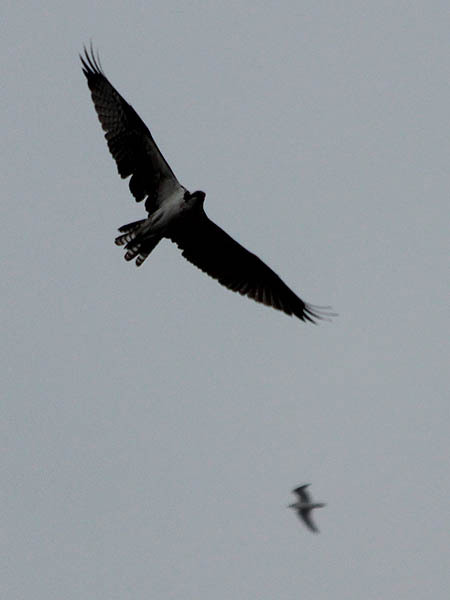 Several Ospreys were hunting along the Trinity. The water level in the river was lower than normal on this day and the Ospreys seemed to be appreciative of these conditions. Perhaps the low water makes it easier for them to fish. At one point I watched an Osprey briefly attempt to hover hunt over the fast moving shallow water. Over the course of the rest of the day I noticed several more of these big raptors carrying fish in their talons. An Osprey fishing the Elm Fork of the Trinity River. 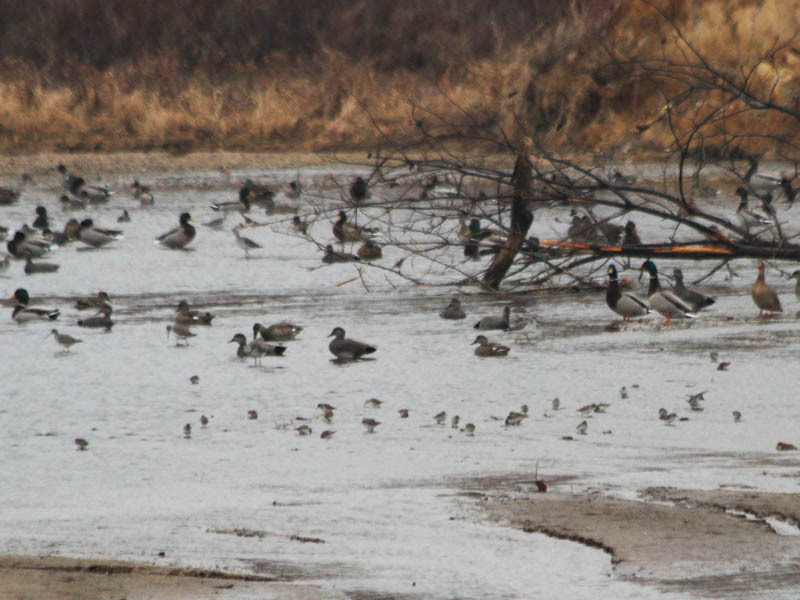 The ducks and wading birds also seemed to enjoy the low water conditions. 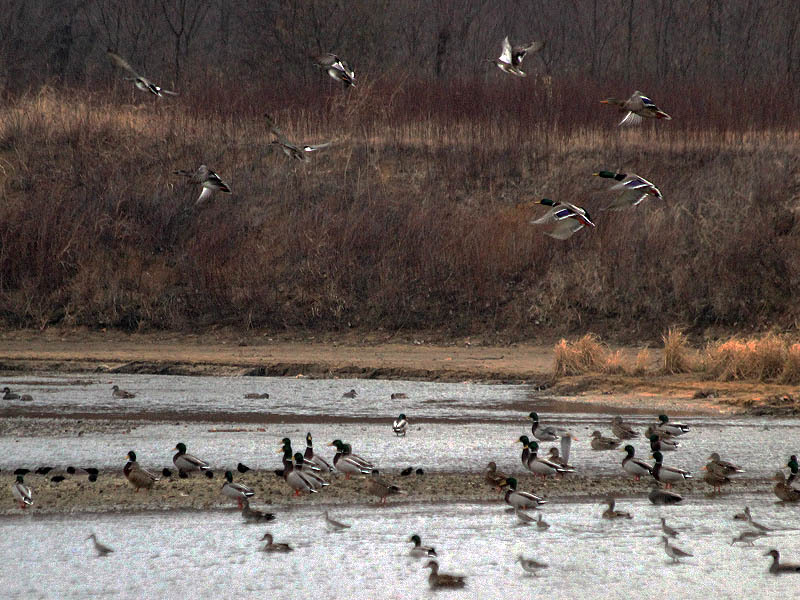 Large congregations of Mallards and Gadwalls were to be seen all along the way. Also in the mix were Greater Yellowlegs and a large number of smaller sandpipers. Waterfowl by the hundreds were gathered along the river. 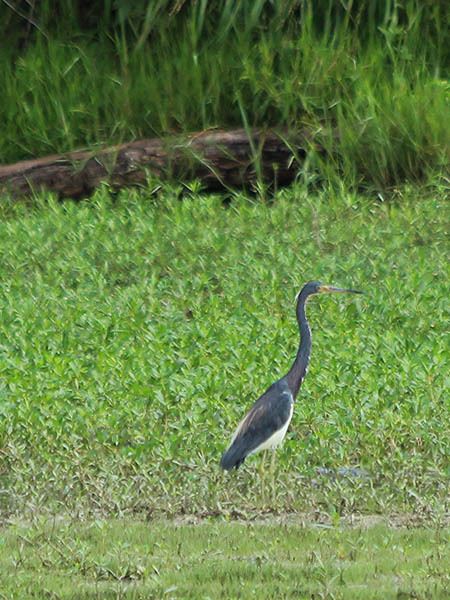 As I continued south along the river I had my most notable encounter of the day. 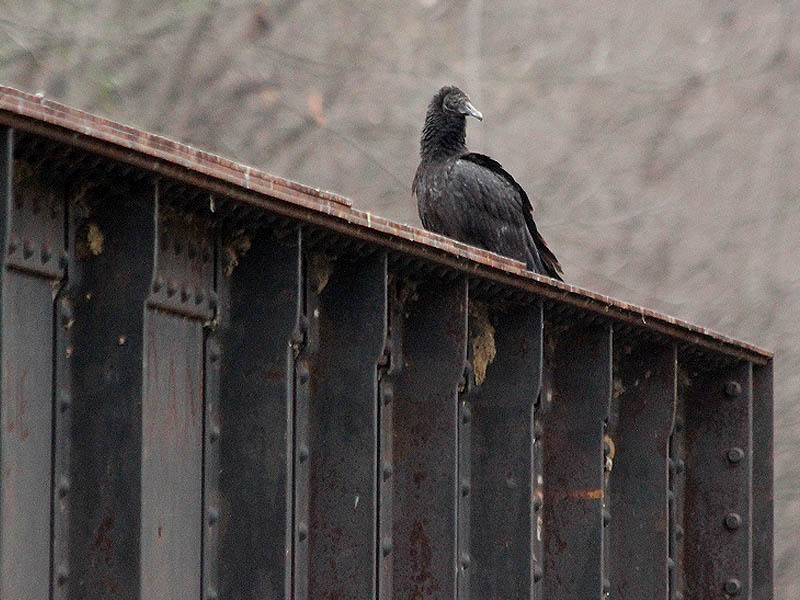 It began when I first heard the rumblings of an approaching freight train while I was still a short distance from the nearby tracks. I paused for a moment to size up the length of the train in order to get some idea of how long it would take for it to pass. 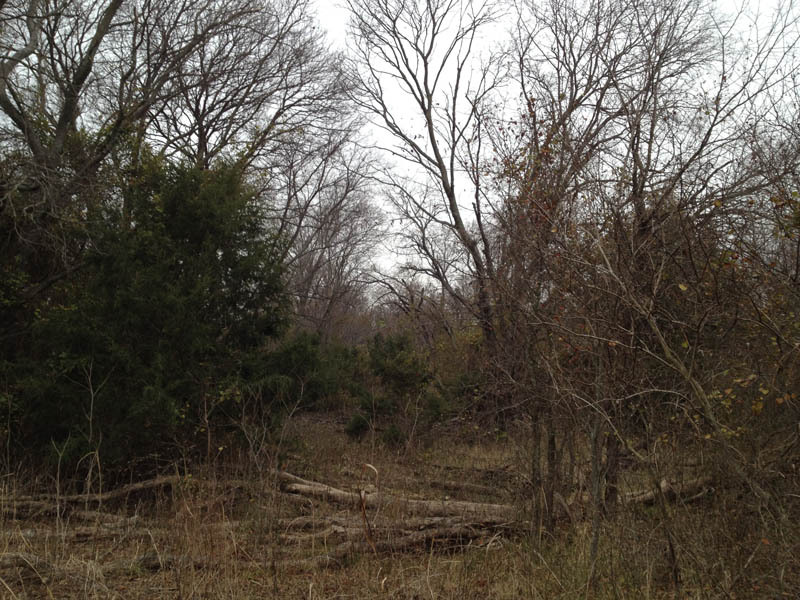 While I stood there, I heard a different kind of ruckus forming in the woods ahead of me. Just then a herd of 8 to 10 deer came bounding out, obviously frightened by the train. They were running down the same trail I was on and headed right for me. Now I was faced with a dilemma. Should I lift my camera and try to photograph the deer, possibly alerting them and diverting them from the path they were on. Or should I stand still and hope they continued on unabated. I opted for second choice and froze where I stood. The deer came at me running at full speed. Just yards in front of me they split into two groups and zoomed past, one to either side. Some deer passed by as close as 10-15 yards. The encounter was over as quickly as it began, and I stood there stunned, not quite believing what just happened. It was definitely a very unique moment. Back on the move again, I soon reached the mouth of Prairie Creek. This is a special spot for me because Prairie Creek and I go way back. 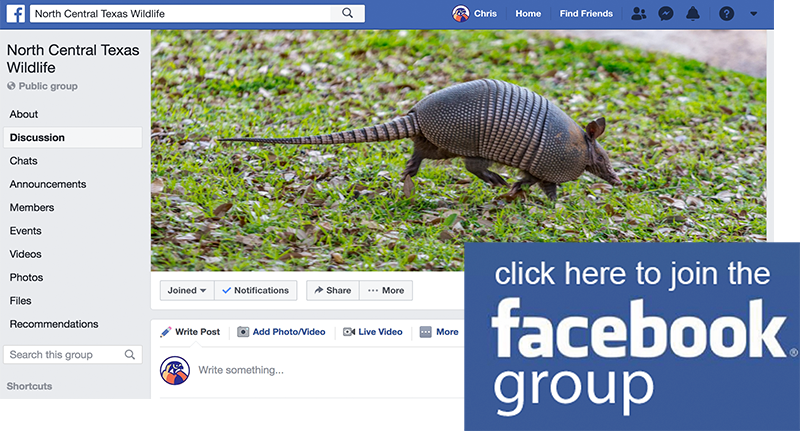 We have a history that I detailed a bit in this post I made last week: Journal – Prairie Creek Past and Present. 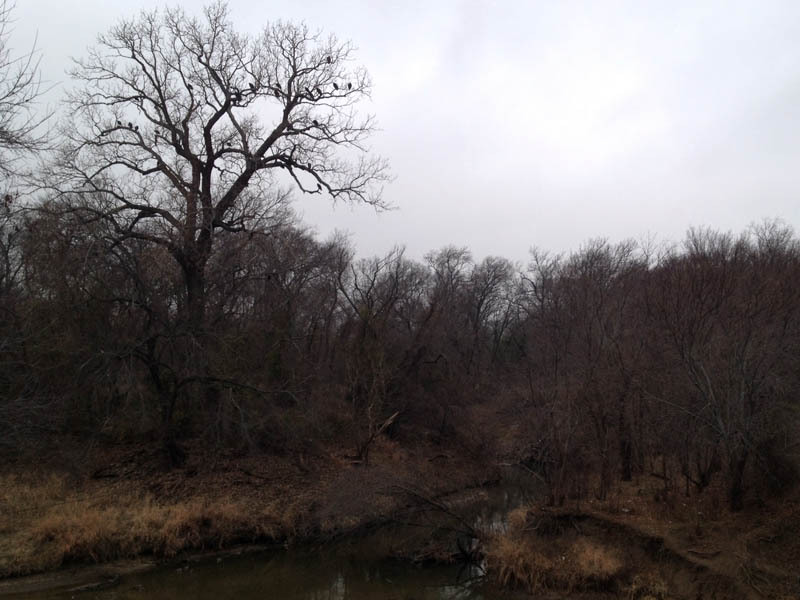 The mouth of Prairie Creek guarded by a roost of big menancing vultures. 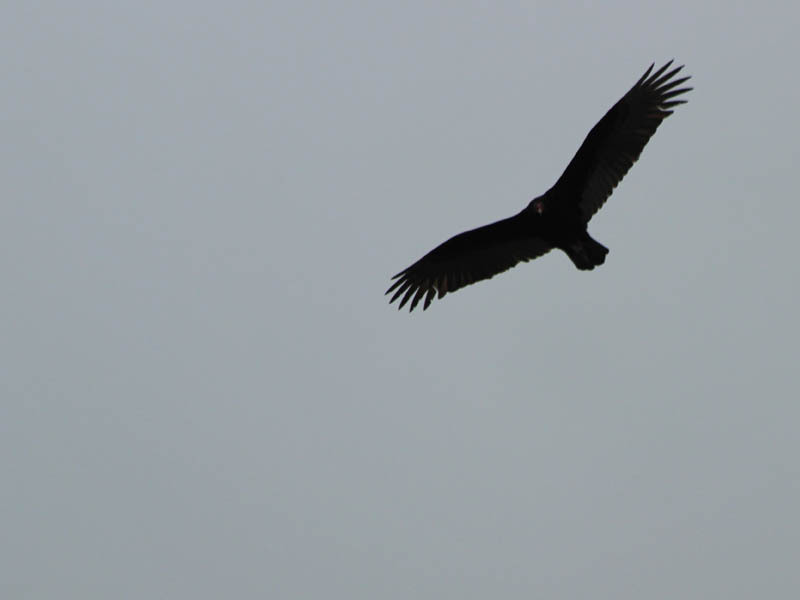 Here at the mouth of Prairie Creek I found a large roost of vultures—both of the Black variety and the Turkey variety. Some of the big birds were in the waters of the river feeding on what I believe is a Nutria carcass. 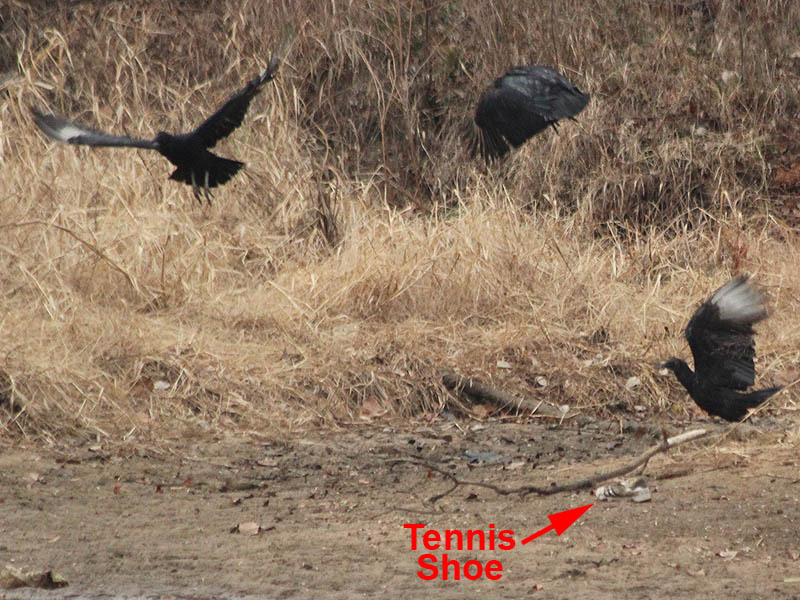 Another group of vultures were down on the bank of the river gathered around a single muddy tennis shoe. A shiver ran down my spine as I considered that scene. Was this all that was left of a wayward explorer? Nah, couldn’t be. 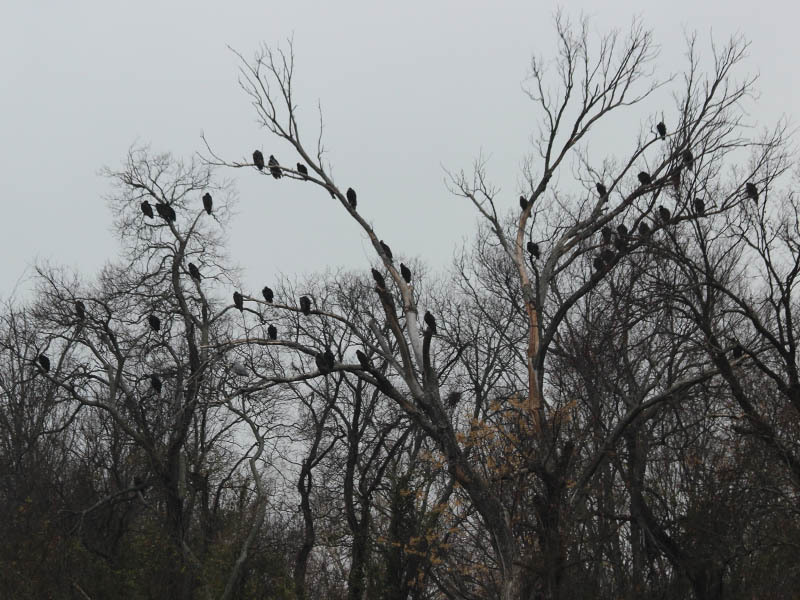 Black Vultures and Turkey Vultures filled the branches of many trees along this part of the river. Just what were these vultures feeding on? 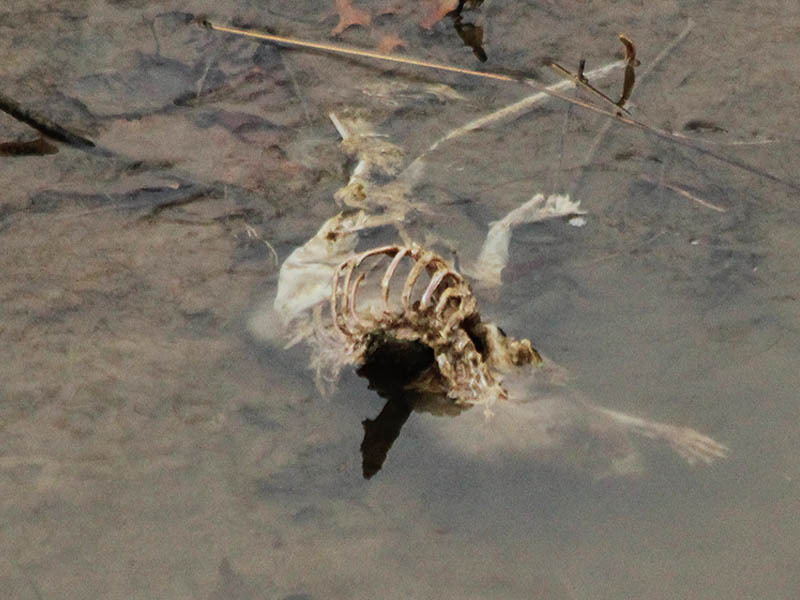 A Nutria carcass in the Trinity River. 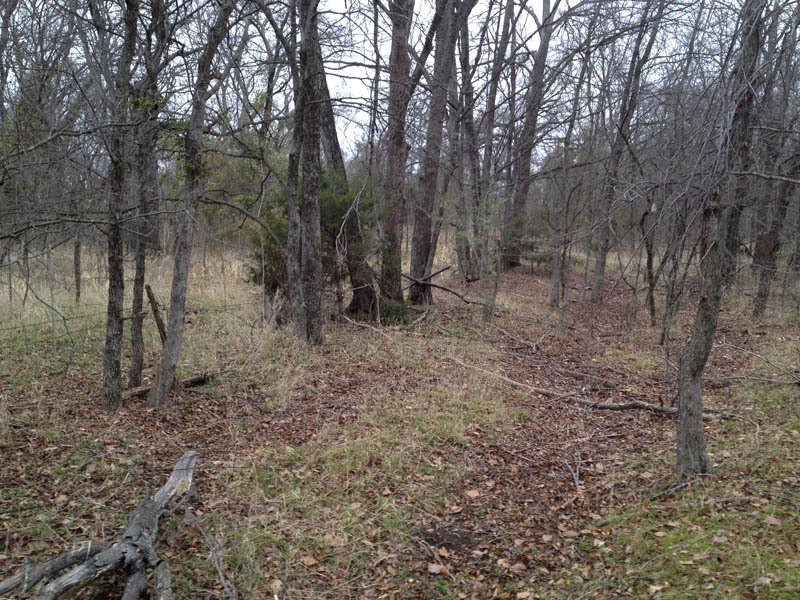 From here I turned back east and soon found what was left of the no-named street that once led to the town of Little Elm in the north. In the opposite direction the barely-still-there road follows a path to the old College Street Bridge abutment down by the river. 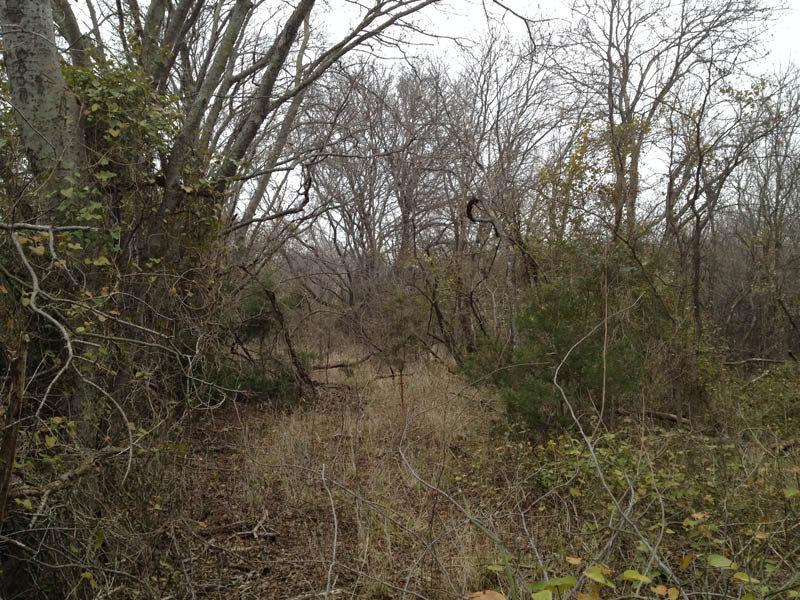 It’s remarkable to think this old country road was once an important thoroughfare in this part of North Texas, even as late as the 1950s. The old forgotten dirt road. Only a suggestion of the road remains. The way is littered with many obstacles. Tangles of vines and branches had to be bypassed. Hints of the old barbed wire fences that lined this country road still exist. The road itself is overgrown and clogged in some places with deadfalls and dense greenbriar vines. It other places the way through was thankfully still relatively clear. 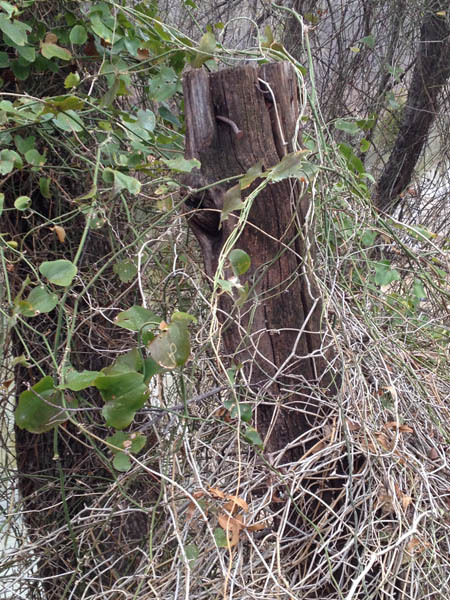 The barbed-wire fence running along side the road is still in evidence in some places. With a little searching a way through could be found. In other places you could barely tell a road had ever been there. 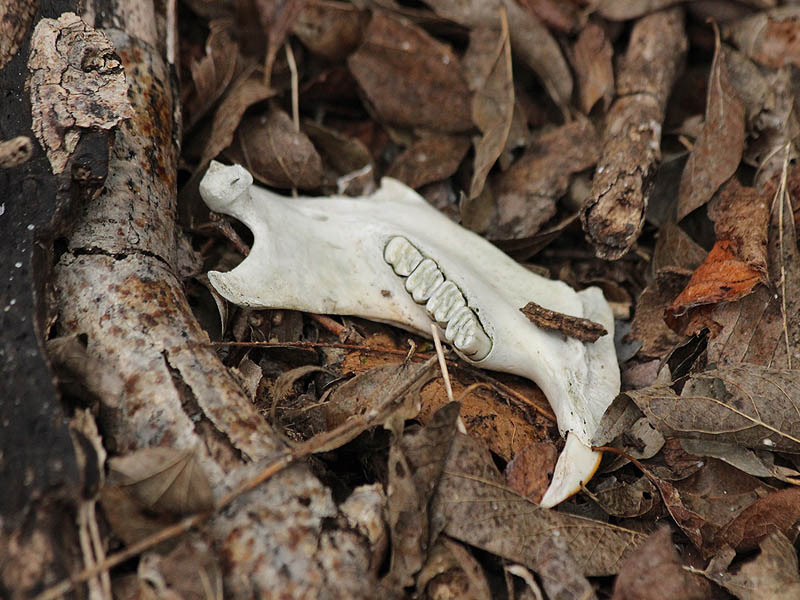 A Beaver mandible found along the way. 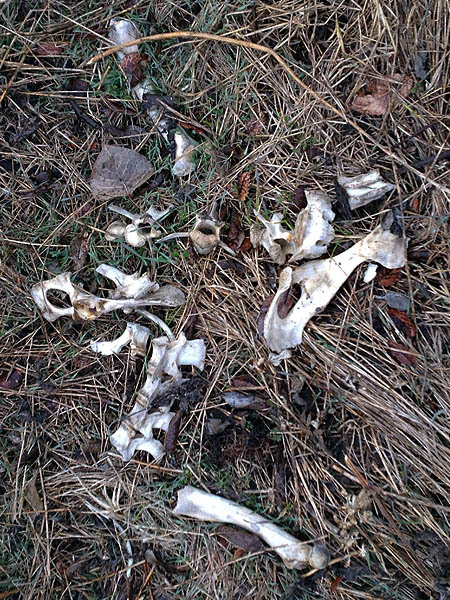 Beaver skeletons are the remains I encounter most frequently in these woods. I continued down the road, and along the way I discovered a number of interesting artifacts. As I neared the bridge I started finding piles of broken up concrete. 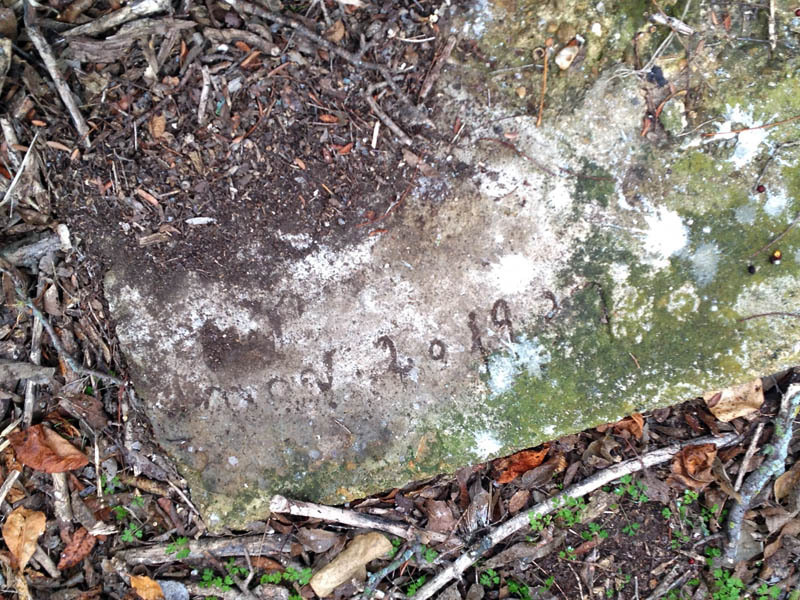 One block I found was hand inscribed with a date that reads “may 20, 1937” or “nov 20, 1939” or some variation of the two—its hard to be certain! 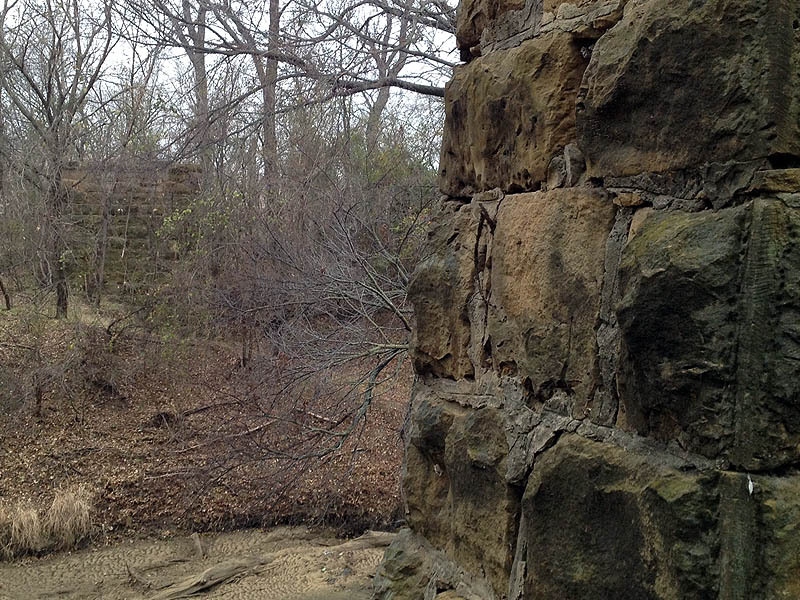 As I neared the bridge location I began to encounter piles of concrete and dirt. 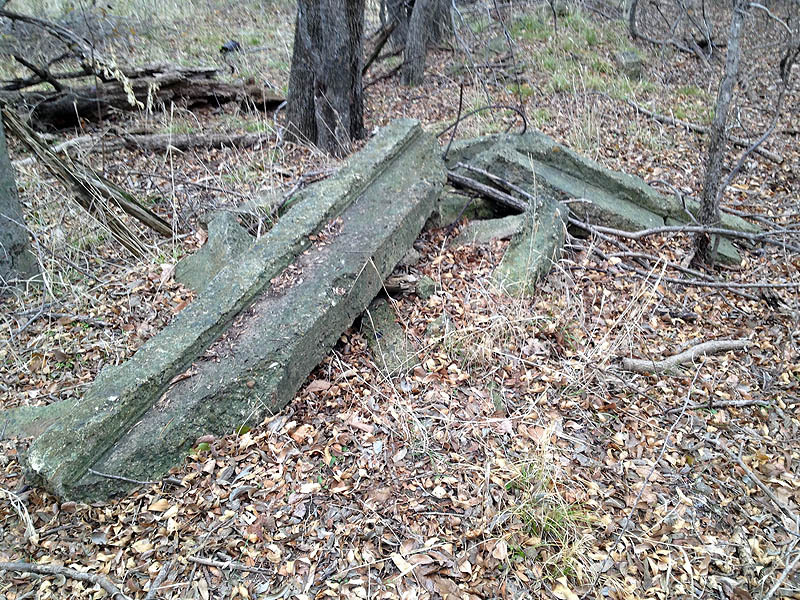 The remains of some discarded concrete structure. Before long the bridge abutment itself appeared in front of me. 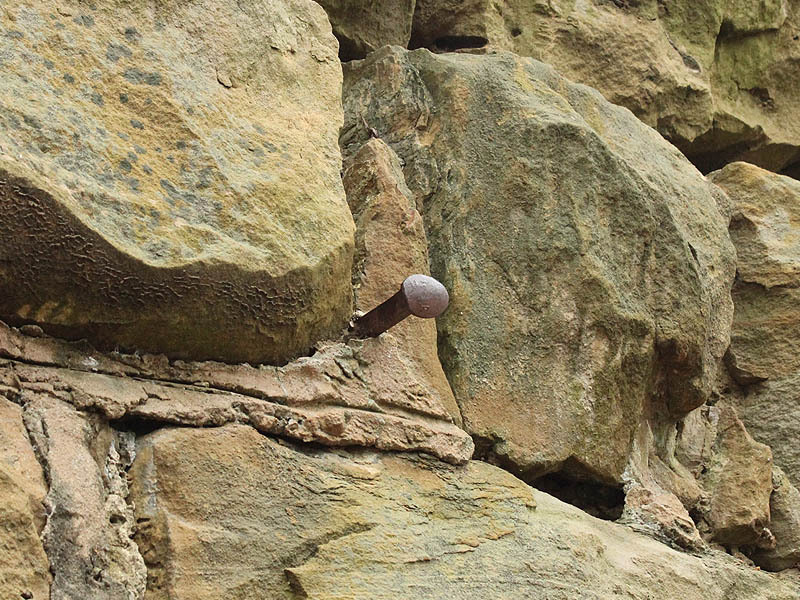 The large stone structure looked every bit the relic of another time that it was. A gently sloped dirt ramp, still defined by its original timber retaining walls, led up to the abutment. Across the river stood another like monolith just visible through the tangle of branches and vines. 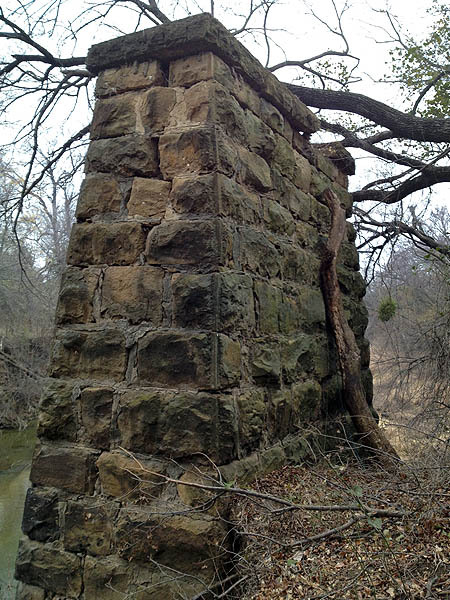 The east side bridge abutment. 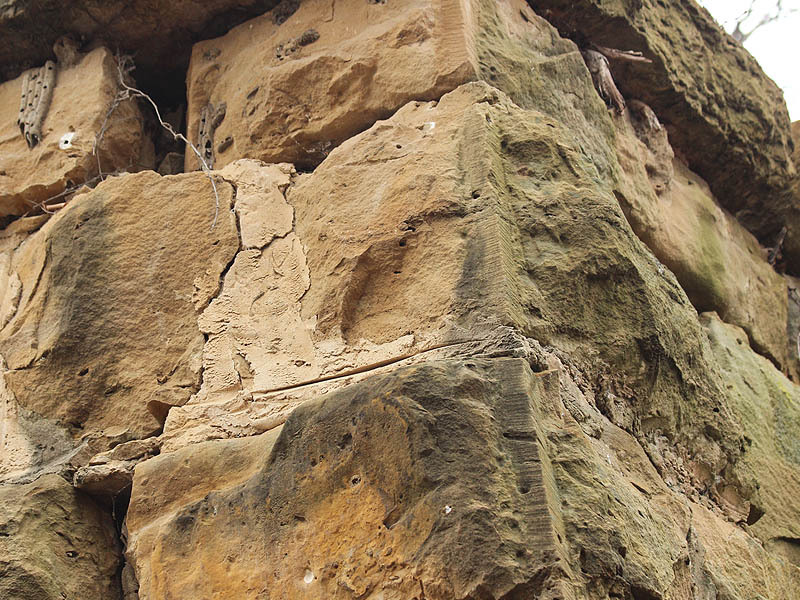 A closer look at the construction of the massive stone structure. 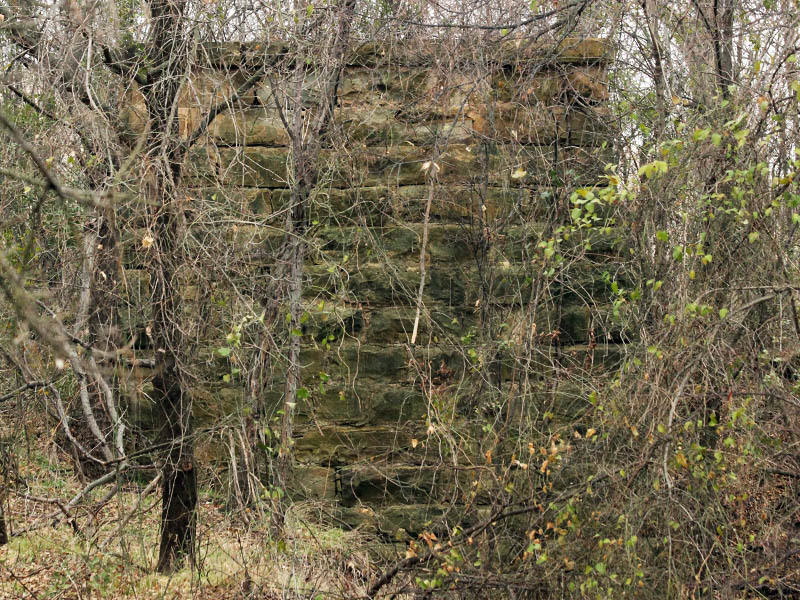 A railroad tie driven into the stone work of the abutment. Purpose unknown. Part of the dirt ramp retaining wall. 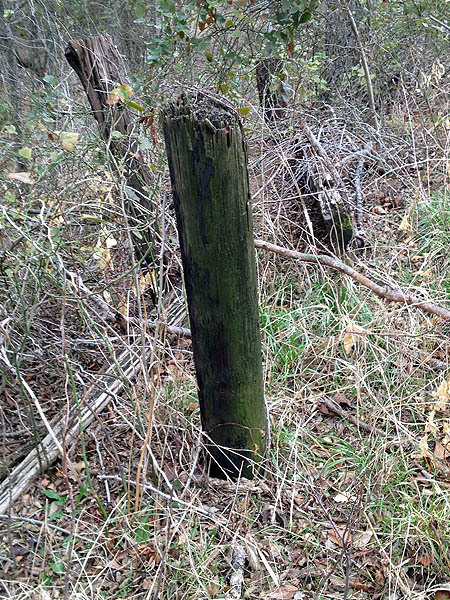 A number of these posts are still installed along the lead up to the bridge. 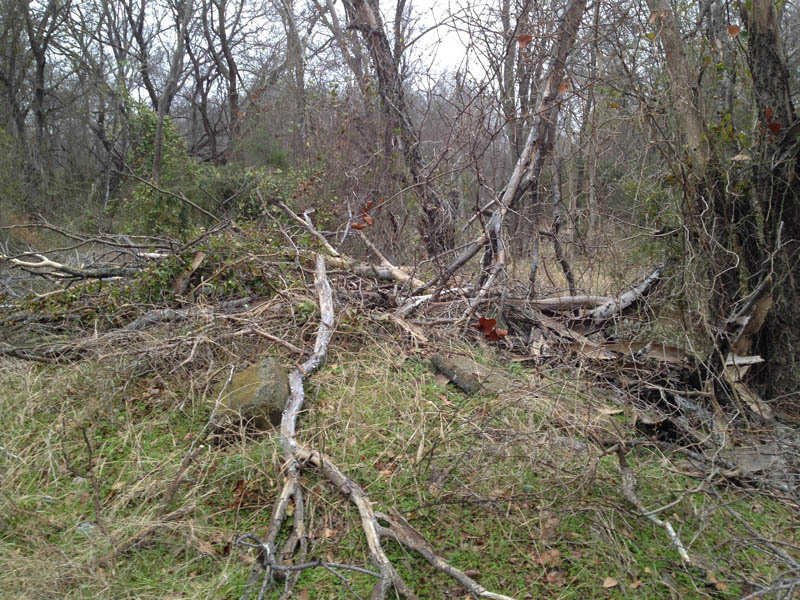 The west side abutment was just barely visible through the tangle of vines and branches on the far side of the river. 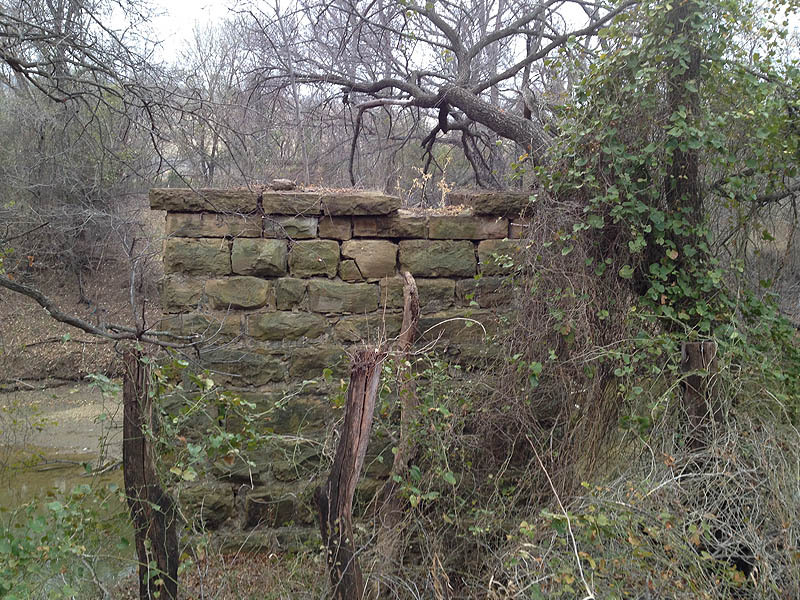 A closer look at the west side College Street Bridge abutment. This is thought to be a photograph of the old College Street Bridge. 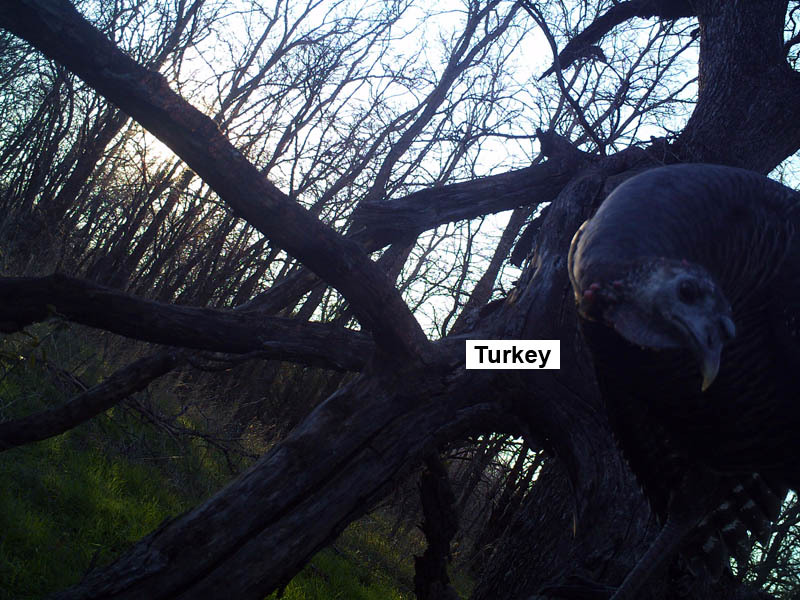 Next on my agenda was stopping by to check on my trail camera set. 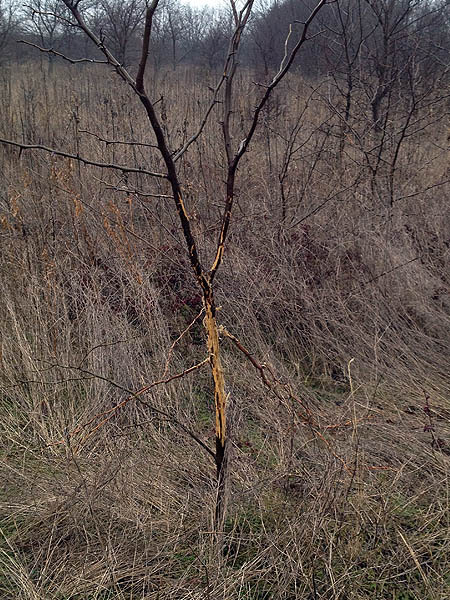 I followed a well worn game trail which was littered with deer droppings and had antler-rubbed saplings about ever 25 yards or so. 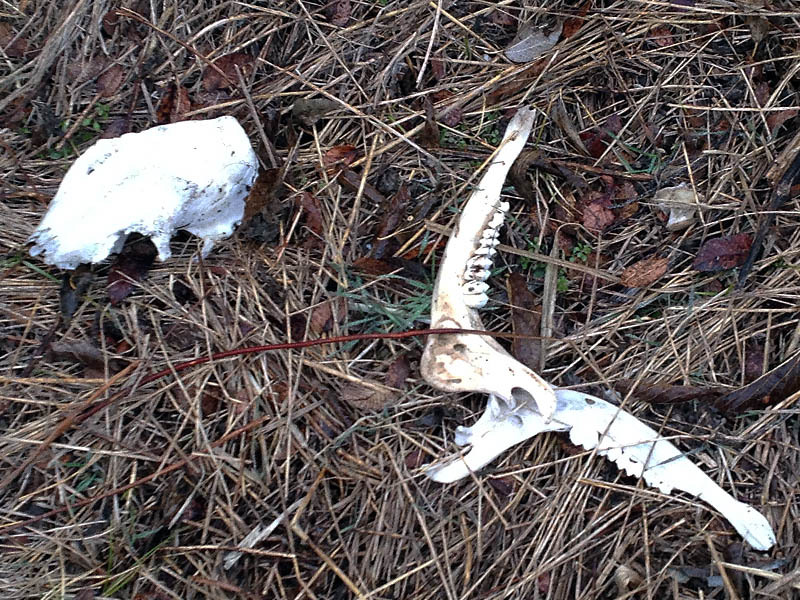 Along the way I found the most complete deer skeleton I have yet come across. 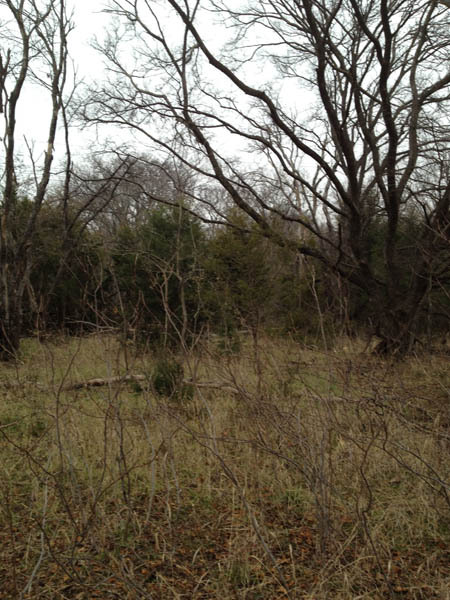 There are a lot of White-tailed Deer on this property. 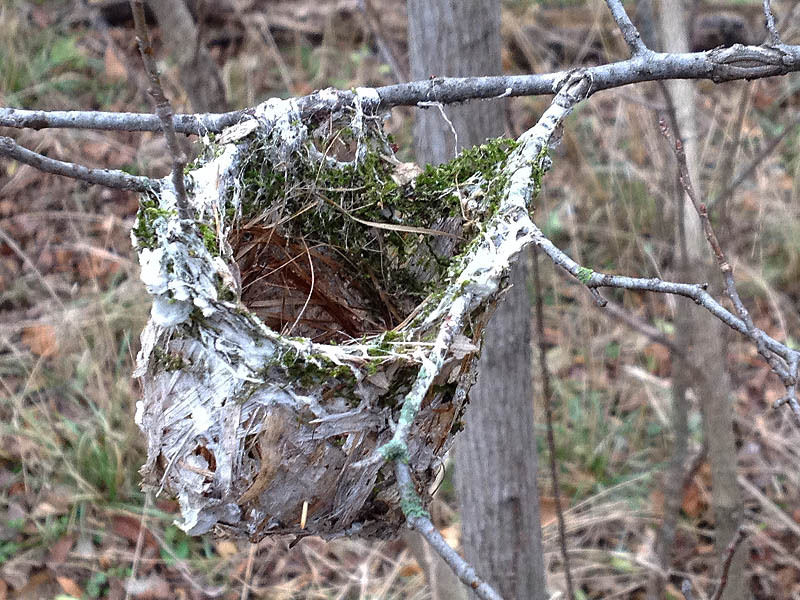 I believe this is a vireo nest of some kind. 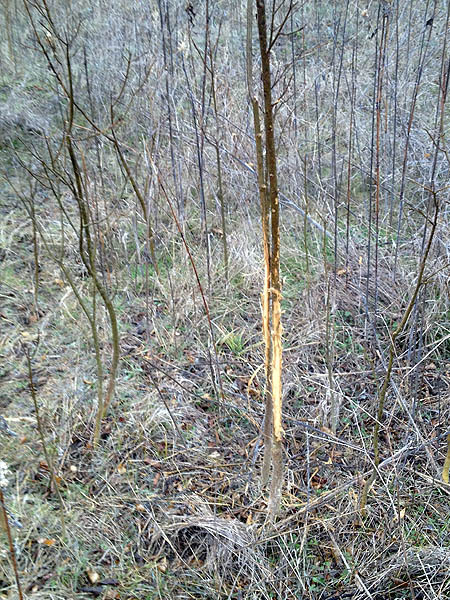 One of many deer scrapes I encounter. 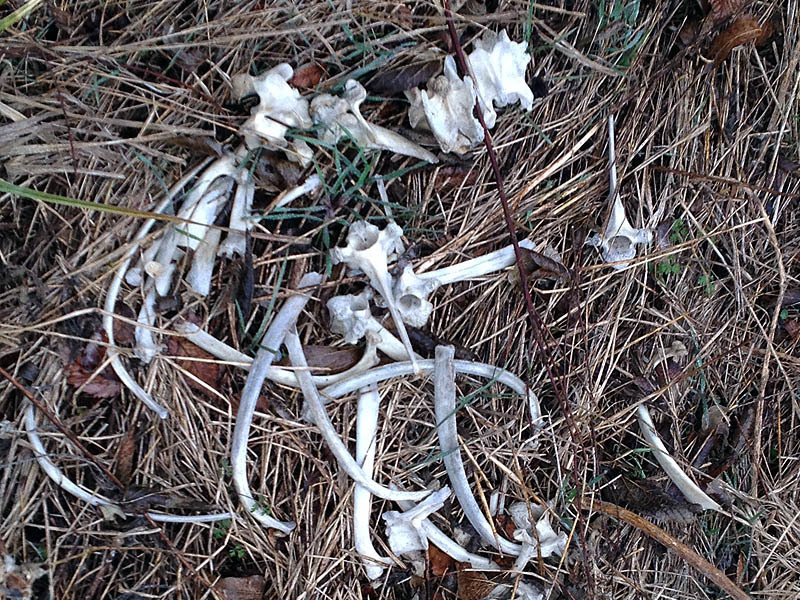 The jowbones and skull of a White-tailed Deer. 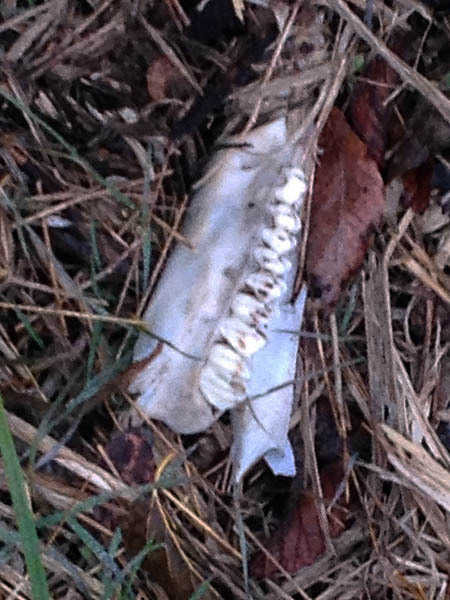 A row of teeth broken off of the deer’s skull. 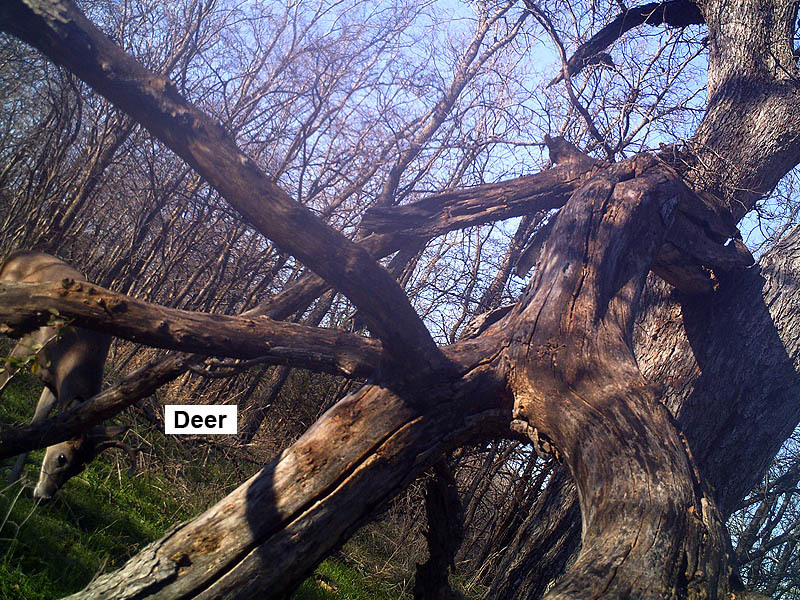 This is the most complete deer skeleton I have yet come across. Leg bones, vertebrae, and the pelvis. 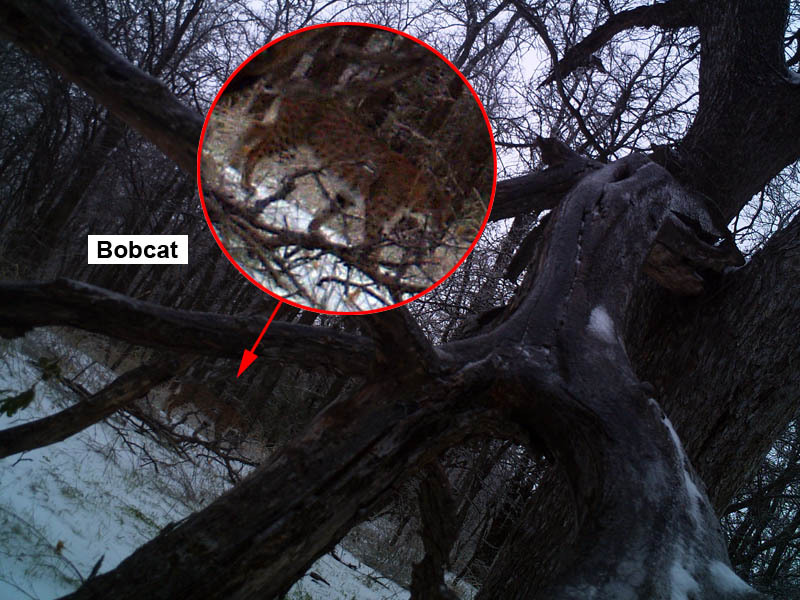 I had photographing a specific animal in mind when I set this camera trap, but I had no luck. I will reveal the identity of the critter I am after at a later date (especially if I ever get one recorded). 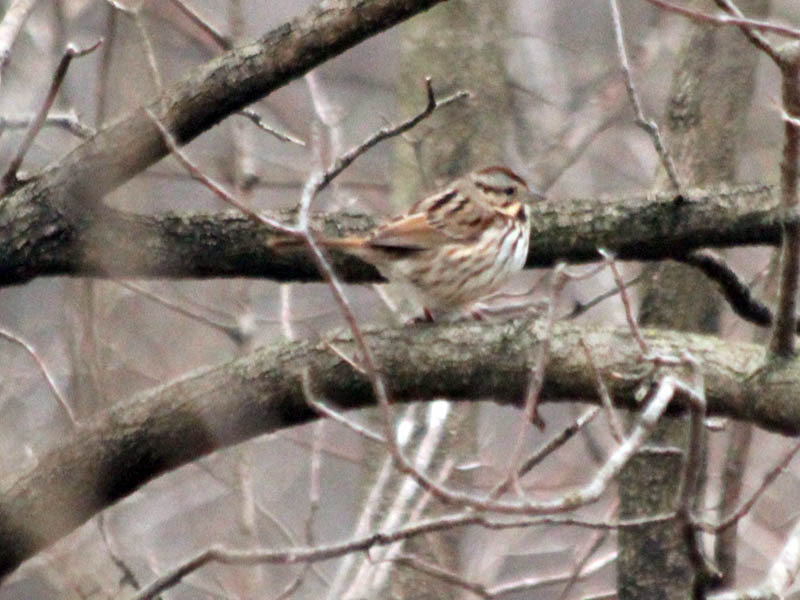 Instead, as you will see in the photographs below, I managed to photograph just about every other animal in these woods. 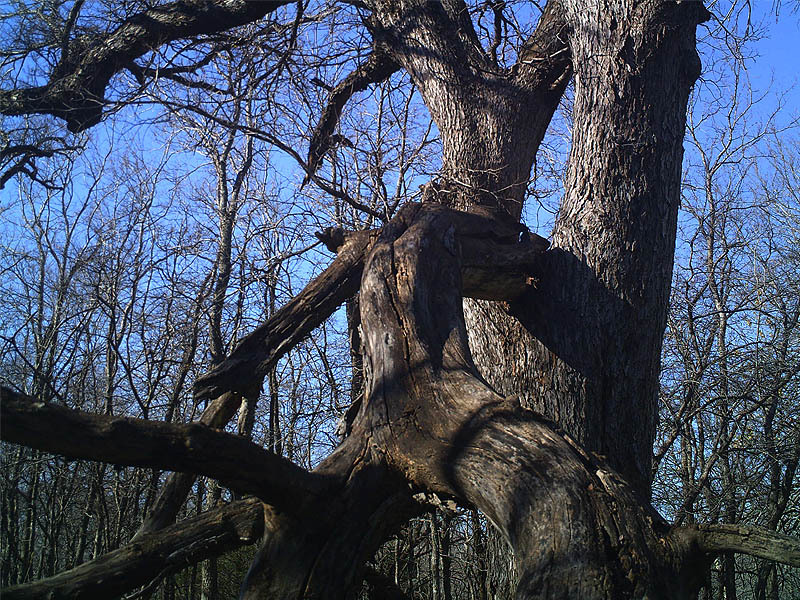 The location of my camera trap. 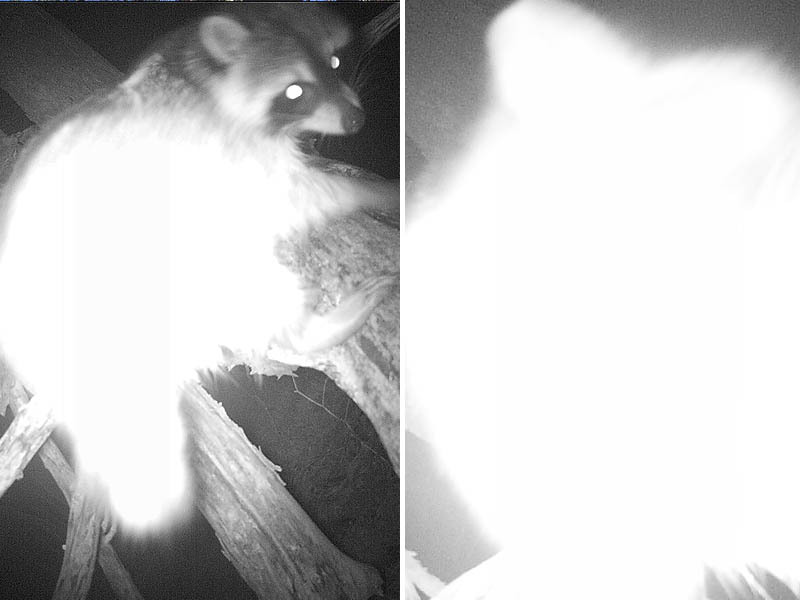 Raccoons in particular make camera trapping a specific kind of animal extremely difficult. Raccoons like any kind of bait you might decide to use. They are not picky. 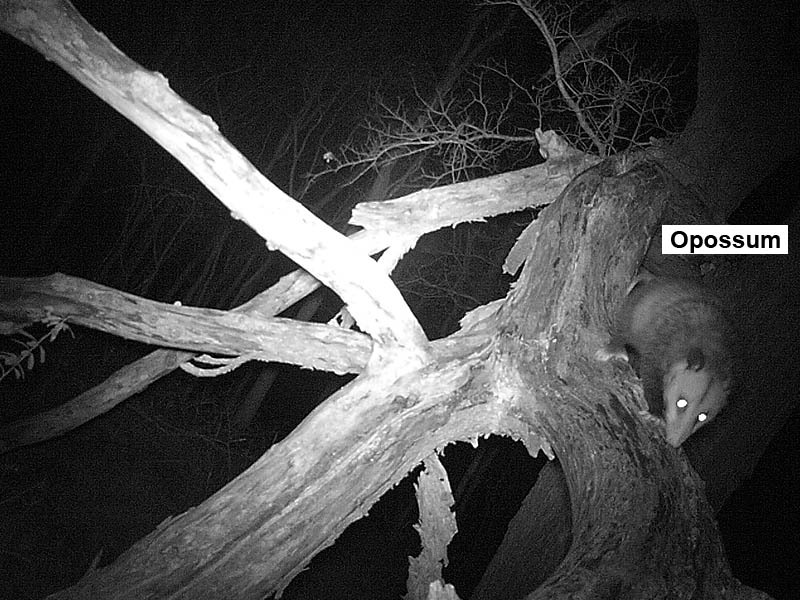 Raccoons are also very curious about new things and will usually give my trail camera a thorough examination when they find one. That then explains the odd camera angle of the pictures below. On the first night of this set, the camera was accosted by an intrigued Raccoon, who left the camera tilted at an odd angle. 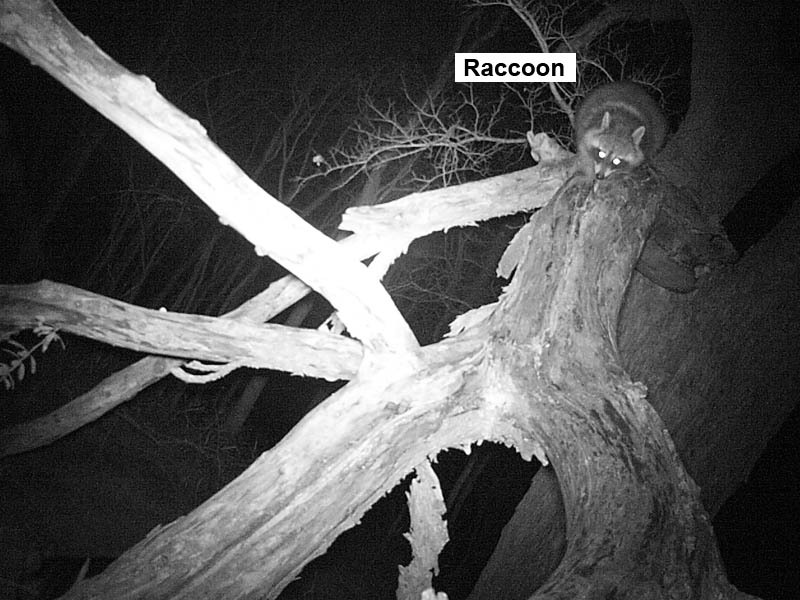 A curious Raccoon making “adjustments” to my trail camera. Previous Previous post: Bald Eagle – Nest: Week Seven Eaglet?